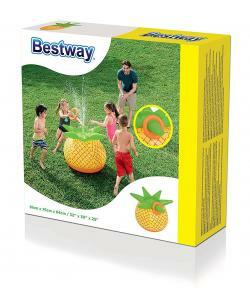 The perfect summer garden accessory, the pineapple blast sprinkler will provide your children and their friends with hours of water-based fun! 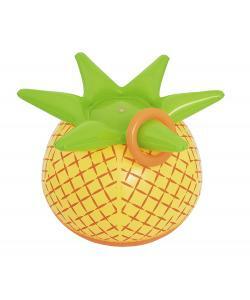 suitable for ages 2 to 5 years, simply inflate this bright and colourful pineapple and attach the garden hose to begin the fun and watch as it sprays them and their friends with jets of water. 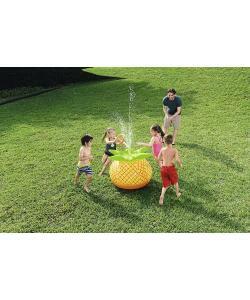 Perfect for in the garden or yard, the pineapple blast sprinkler sends a high-powered water jet into the air, soaking anyone who comes close. It even comes with an inflatable ring so the children can have a game of ring toss whilst trying to avoid being splashed by this brilliant garden sprinkler! comes with one inflatable repair patch to ensure the water-based fun continues throughout the summer. Warning: adult Supervision required.